Disclaimer: not my advent wreath, the candles didn't last all the way through. Next time, I'm getting pillars. Hello everyone, I am so sorry that I missed out on posting during Advent, but am very thankful that Thankful at Always Giving Thanks was praying for me all along. I could definitely feel the graces and we had a lovely Christmas. Thank you for keeping our intentions in your heart! I had the pleasure and the honor to pray for Sew who made a very exciting announcement this Advent. Sew, I really did stick to the specific intentions you asked for, but you can bet that once I learned there was another little Sew on the way, I upped the prayers! I offered my St. Andrew Novena for you and your family and remembered you in all the Masses I attended this Advent, most especially at Midnight Mass. 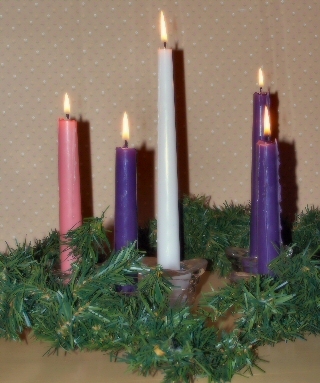 It was a blessing to be mindful of your intentions during the Advent season.